Hagit Barkai is an artist and professor, somewhat new to the Charlotte area. Her work in incredibly beautiful and intriguing, and we’re so glad she’s part of our community. HappeningsCLT: Describe yourself in three words. Looking back at us with a mixture of intent, fear, and defiance, Hagit Barkai’s paintings increasingly implicate viewers in the process of seeing. Her haunting images do not smooth over disruption and anxiety. Instead, they open the abyss between knowledge and unintelligibility. Religion Professor Hun Lye and Davidson student Audrey Gyurgyik guide private viewing rooms at the opening of Hagit Barkai’s exhibit in the Van Every Gallery, “It looks Something Like This.” The oil paintings will be on display until Dec. 7. Art faculty, Hagit Barkai, opened "It Looks Something Like This," an exhibit of evocative figurative paintings on Thursday, November 3, 2011. A crowd of students, faculty and art enthusiasts gathered in the Katherine and Tom Belk Visual Arts Center (VAC) to celebrate as Barkai debuted her work to the Davidson community. HOUSTON (May 4, 2010) - This May, the Spacetaker's Artist Resource Center (ARC) will host "Additional Support," a group exhibition featuring paintings by Hagit Barkai, body casting sculptures by Kelley Devine and small metal sculptures by Jessica Jacobi. An opening reception will be held from 6 to 9 PM on Saturday, May 15th, complete with a fashion show of the wearable works and a live body casting demonstration. The show will remain on display through June 19th, and the public is invited without charge. The featured artists are currently Houston residents and were chosen to exhibit together due to their respective works’ treatment of the human form. Support: to be capable of bearing; withstand. The body demands support due to numerous physical and psychical circumstances. As the body progresses through it’s lifetime, its natural framework is challenged, and the need for additional support is revealed through the body’s awkwardness, vulnerability, and visceral nature. In response, individuals and society create various tools to hide, enhance, or transform the body (i.e. undergarments, piercings, etc. ), enabling it to function in an acceptable way within society. Additional Support explores possible manifestations of such creations– if a body accepts society’s methods of support, is the body in turn accepted by society? The work demonstrates tension between acceptance of and repulsion to the body, calling into question the motivations behind such judgments and redefining the notion of “misfit.” In exploring the body’s incongruence with its surroundings, the three bodies of work represent failed attempts to reconcile the physical image of the body with self-image. The exhibition also plays with the artwork’s need for support to assume meaning: from the video and performances supporting the wearable art and the cast hangers giving a sense of the missing body, to the paintings negotiations with the frame. Jessica Jacobi’s small metal sculptures are designed to question methods for defining acceptable body conditions. Originally from Houston, she received her B.F.A.in Studio Art at the University of Texas at Austin and her M. F. A. in Metals and Jewelry Design from Texas Tech University. She has exhibited at national juried exhibitions -- from Elder Gallery in Lincoln, Nebraska to Meadows Gallery at the Center for the Visual Arts in Denton, Texas. She exhibited in 2008 Craft Texas show at the Houston Center for Contemporary Craft and her works have also been displayed at Runnels Gallery, Eastern New Mexico State University and Landmark Arts Studio Gallery at Texas Tech University School of Art. Originally from Israel, Hagit Barkai received an MFA degree from Penn State University, a B.A. in Philosophy from the Hebrew University of Jerusalem, and also studied at the Jerusalem Studio School. Her work has been shown in exhibitions at Praxis Gallery, New York; Houston Art League; Chashama, Gallery, New York ; Crane Gallery, Philadelphia; Fe Gallery, Pittsburgh; and the Pennsylvania State Museum, in Harrisburg. She has been featured in the Houston Chronicle; the Pittsburgh City Paper, and in Research Penn State. Awards include the College Art Association Professional Development Fellowship in Visual Arts in 2008, first place for the Visual Arts in the Graduate Research Exhibition at Penn State University in 2007, a travel grant to Israel from The School of Visual Arts at Penn State in 2006, and being selected to represent Penn State in the Big Ten Conference in Chicago in 2006. Barkai said she looks at “body languages of vulnerability, awkwardness and misfits as expressions that move between acceptance and resistance.” She seeks to maintain balance between one’s struggles to gain visibility and struggles to escape it. “I paint bodies for what they fail to be, for how they fail to settle in any image or concept that confine and regulate them, and for how they are never able to close the gap between appearance and experience,” the artist explains. “I am painting in an attempt to capture this moment of losing and gaining respectability. For more information about Spacetaker, visit the www.spacetaker.org. Spacetaker is a 501(c)3 professional organization and Artist Resource Center located in Houston’s First Ward whose mission it to provide artists and small non-profits access to economic development, continuing education, and networking opportunities to support their professional growth. Spacetaker is located at 2101 Winter Street, Studio B11 Houston 77007. Art League Houston is pleased to announce ConcealDisclose, an exhibition of paintings by Hagit Barkai and photographs by Tala Vahabzadeh, which will be on view in the ALH project space May 8 through June 19, 2009. The opening reception for the exhibition is Friday, May 8, 2009 from 6:00 - 8:00 p.m., with an artist talk by Hagit Barkai at 6:15 p.m. While contemporary art has long inclined toward personal expression and individual concerns, current events have inspired many artists to politicize their aesthetic and conceptual approaches. These artists, moreover, have gone beyond exploring subcultures and bringing little-recognized wrongs to light. Now they've taken up unswerving, no-holds barred criticism of the prevailing socio-political system. We haven't seen this kind of concentrated anti-war effort in the art world since Dada. While this is a strong statement to make, Fe Gallery's exhibition Pinky Swear: A Political Exhibition Addressing Promises is worthy of it. The Urban Dictionary defines a "pinky swear" as an eternally binding promise made by two people hooking pinky fingers together. Breaking the promise is supposed to result in the offender losing his or her pinky. Curator Vicky A. Clark unites this concept of pledges with political commentary. The exhibition features works by members of Group A, an association founded in 1944 and credited with establishing the Pittsburgh Center for the Arts. While all of Pinky Swear's works speak out against America's present political course, some are more searing in their condemnations than others. Perhaps the most conceptually compelling is Bob Ziller's 2007 sculpture "Trophy." It directly addresses the issue of broken promises, particularly those relating to the Geneva Conventions and the writ of habeas corpus, meant to prevent unlawful detention. Composed of a rusty shovel head mounted on a concrete cylinder, "Trophy" bears the scratched silhouette of the now-iconic hooded and wired Abu Ghraib prisoner Satar Jabar. The aggressive method by which the image was created -- by scraping away the shovel's surface -- and the conceptually shrewd use of the shovel itself contribute to the work's power: Shovels are funerary implements crucial to burial. They also imply hole-digging, both ideological and literal. 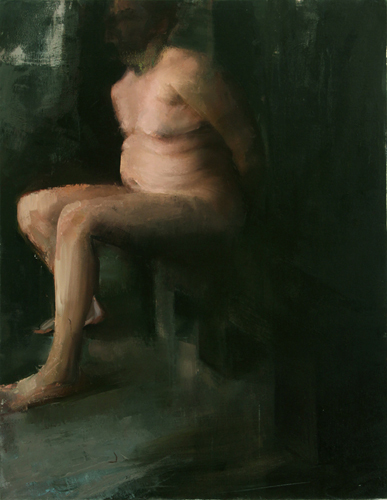 Hagit Barkai's oil on canvas "The Waiter" (2007), which depicts a near-faceless, naked figure apparently bound and seated on a wooden bench, and Judy Charlson's undated raku bas reliefs "Hanging Out in Baghdad" all deal with confinement, torture and the paradox of "forced democratization" on a more visceral level. Another conceptual jewel is Wendy Osher's "Invisible Bridge," made from wire, rubber bands, chewing gum and newsprint. These materials, respectively associated with quick fixes and propaganda, would not bear the weight of a toy soldier. Yet the construction lingers above viewers, presenting letter-for-letter the Bush administration's comfortless message: "Stay the Course." Paula Weiner's mixed-media work "Sedition Flag" depicts an American flag behind Plexiglas on which she has written: "Our Country 'tis of thee has secrets thou shalt never see." Alongside are citations from the 1917 Espionage Act -- implying the 1918 Sedition Act, which made speaking out against the government treasonous. Although the Sedition Act was repealed in 1921, Weiner points out that parts of the Espionage Act remain law. Ultimately, Pinky Swear speaks to more than broken promises. It also reflects our tendency toward continuous, soul-sedating consumption. Witness Steve Hasley's "Toxic Iconography #1," featuring pretend explosives sheathed in Wal-Mart bags, and Jennifer L. Dinovitz's mixed-media medicine cabinet in "Hard Pill to Swallow." There is much food for thought in Clark's exhibition and more complexity than can be explored here. Because the artists' passion is obvious, their messages compelling and their political engagement genuinely exciting, the exhibition is certain to stay with visitors long after they've left the gallery. The show's value, with its implicit call to think critically, goes beyond political appraisals. And while there is certainly the aforementioned whiff of Dada -- which revolutionized how art was used as a means of constructive dissent -- in Pinky Swear, the artists' dissent involves no gratuitous aesthetic anarchy or baffling logic. The messages are well reasoned, historically anchored and unequivocal.